As of June 30, 2013, the last day of the Registrant’s most recently completed second fiscal quarter, there was no established public market for the Registrant’s common stock. As of April 14, 2014, there were outstanding 49,431,443 shares of the registrant’s common stock, $.0001 par value. Next Graphite, Inc. (the “Company”) was incorporated under the name Zewar Jewellery, Inc. on September 26, 2012 in the State of Nevada. The business plan of the Company was originally to operate as an on-line imitation jewelry retailer. Immediately after the completion of the Share Exchange, the Company discontinued its on-line imitation jewelry business and changed its business plan to exploration and development of the license area covered by the License. Effective December 16, 2013, the Company changed its name to Next Graphite, Inc.
On November 14, 2013, we consummated transactions (the “Share Exchange”) pursuant to a Share Exchange Agreement (the “Share Exchange Agreement”) dated November 14, 2013 by and among the Company and the stockholders of African Graphite, Inc., a private Nevada corporation (“AGI” and the “AGI Stockholders”), whereby AGI Stockholders transferred 100% of the outstanding shares of common stock of AGI held by them, in exchange for an aggregate of 8,980,046 newly issued shares of the Company’s common stock, par value $.0001 per share (“Common Stock”). On November 14, 2013, AGI entered into a Stock Purchase Option Agreement (the “Option Agreement”) with NMC Corp., a corporation organized under the laws of the Province of Ontario, Canada (“NMC”), whereby NMC granted to AGI an option to purchase 90 ordinary shares, par value one Namibian dollar per share, of Gazania Investments Two Hundred and Forty Two (Proprietary) Limited, a corporation organized under the laws of the Republic of Namibia ("Gazania"), representing 90% of the issued and outstanding shares of Gazania, for $240,000. NMC had entered into an option agreement dated March 29, 2013, as amended on November 4, 2013 (the “Centre Agreement”), with Centre for Geoscience Research CC (formerly known as “Industrial Minerals and Rock Research Centre CC”), a company organized under the laws of the Republic of Namibia ("Centre"), whereby Centre agreed to transfer to Gazania 100% undivided interest in the exclusive prospecting license No. 3895 known as AUKUM originally issued to Centre by the government of the Republic of Namibia on April 4, 2011 and renewed on April 4, 2013 (the “License”). The License grants the right to conduct prospecting operations, bulk sampling and pilot production in the license area called AUKAM located in southern Namibia in the Karas Region within the Betaine district. The license area covers about 49,127 hectares. The only mine in Namibia which has produced graphite is situated in the license area. The ore body lies on the eastern slope of a prominent range of hills which rises 120 to 150 meters above the level of the surrounding sand-covered valleys. The country rock consists almost entirely of grayish, medium-to-coarse grained granite and gneissic rocks of the Namaqualand Metamorphic Complex. The transfer of the License to Gazania was approved by the Ministry of Mines and Energy of the Republic of Namibia on February 25, 2014. Under the Option Agreement, AGI was required to pay to NMC $90,000 as an advance payment to be credited towards the purchase price of the Gazania shares. The Company made the advance payment on November 14, 2013. The balance of the purchase price in the amount of $150,000 was paid by AGI upon exercise of the Option that was completed on March 14, 2014. As a result, Gazania became a direct 90% owned subsidiary of AGI and an indirect subsidiary of the Company. On November 14, 2013, the Company issued 12,600,003 shares of Common Stock to NMC in connection with the Option grant closing under the Option Agreement. In connection with the issuance of 12,600,003 shares of Common Stock, NMC entered into a Stock Escrow Agreement and a Lock-Up Agreement with the Company. Pursuant to the Stock Escrow Agreement, NMC delivered to the escrow agent the shares of Common Stock issued to it to be held by the escrow agent pending the closing of the Option exercise to purchase shares of Gazania by AGI under the Option Agreement in which case such 12,600,003 shares of Common Stock will be released by the escrow agent to NMC. The shares were released from escrow following the closing of the option exercise on March 14, 2013. Under the Option Agreement, we undertook to provide at least $260,000 of working capital to or for the benefit of Gazania from the option grant closing date to June 30, 2014. Under the Lockup Agreement executed on November 14, 2013, NMC agreed not to offer, pledge, sell, contract to sell, sell any option or contract to purchase, purchase any option or contract to sell, sell short, grant any option, right or warrant to purchase, lend or otherwise transfer or dispose of any shares of Common Stock, or enter into any swap or other arrangement that transfers any economic consequences of ownership of Common Stock until 12 months after the date therein. From November 2013 to March 2014, the Company entered into and consummated transactions pursuant to a series of the Subscription Agreements (the “Subscription Agreements”) with certain accredited investors whereby the Company issued and sold to the investors for $1.00 per share an aggregate of 1,221,400 shares of the Company’s Common Stock for an aggregate purchase price of $1,221,400 (the “Private Placement”). The Subscription Agreements contain representations and warranties by the Company and the investors which are customary for transactions of this type such as, with respect to the Company: organization, good standing and qualification to do business; capitalization; subsidiaries, authorization and enforceability of the transaction and transaction documents; valid issuance of stock, consents being obtained or not required to consummate the transaction; litigation; compliance with securities laws; and no brokers used, and with respect to the investors: authorization, accredited investor status and investment intent. Effective December 16, 2013, a 7.8-for-1 forward stock split of the Company’s issued and outstanding Common Stock was effected (the “Stock Split”). As a result of the Stock Split, 9,602,569 shares of common stock issued and outstanding immediately before the Forward Split increased automatically, and without any further action from the Company’s stockholders, to 74,900,039 shares of common stock. The authorized number and par value of common stock were unchanged. On March 20, 2014, the Company entered into a consulting agreement with Wall Street Relations, Inc. (the “Consultant”). Under the agreement, the Consultant will provide to the Company public relations, communications, advisory and consulting services. The term of the agreement is 12 months. For the services to be rendered under the agreement, the Company paid to the Consultant an aggregate amount of $500,000 in cash. The Company is a development stage company targeting the growing global graphite production industry with its 125,000-acre Africa-based Aukam Graphite Mine. 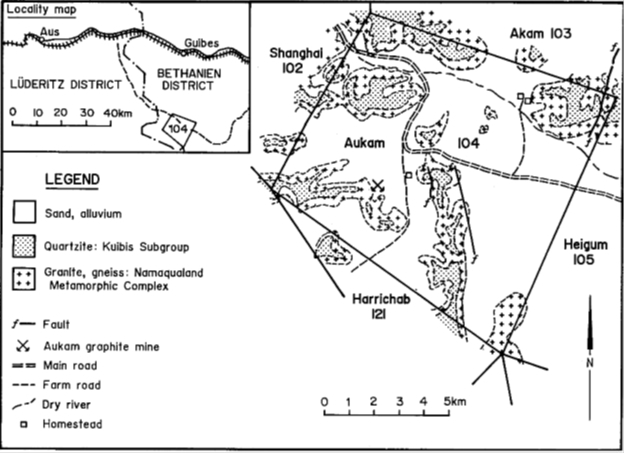 The Aukam Graphite Mine was established in 1940 in the current Republic of Namibia, produced $30 million of graphite at today's prices until 1974, and is estimated by the Company’s geological consultants to hold over 4 million tons of natural, high-grade, large-flake, hydrothermal-sourced graphite reserves. The mine is currently abandoned. 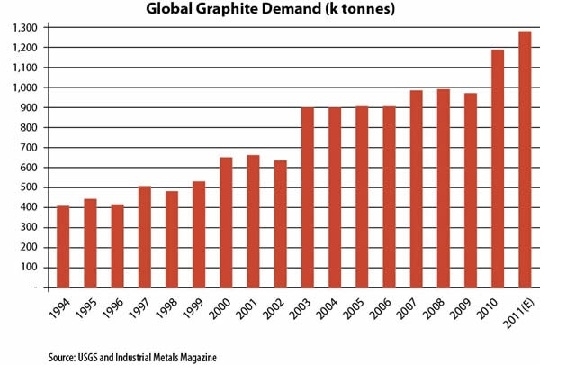 Global graphite demand is being driven by the development of new markets for clean and efficient energy alternatives, smart grid infrastructure and military capabilities. Next Graphite has an immediately available, surface-visible, estimated 140,000-ton stockpile, along with competitive projected mining and processing costs. The Aukam Graphite Mine is located in southern Namibia in the Karas region within the Betanie district 169 km from the port of Luderitz. The nearest town of Aus is some 87 km away by road. The license area spurns about 49,127 hectares stratiform base metal that form part of the Namaqualand meta-sedimentary sequence. The infrastructure in the area is good with access to the site possible throughout the year. The Aukam Graphite deposit is relatively close to a main tar road and well graded so the only construction required would be an approximately 2 km long access road to the site. There is a national power grid that passes right by the property. Water is available in large amounts from underground aquifers. The nearest rail link is located next to the main highway (some 70 km from the site). 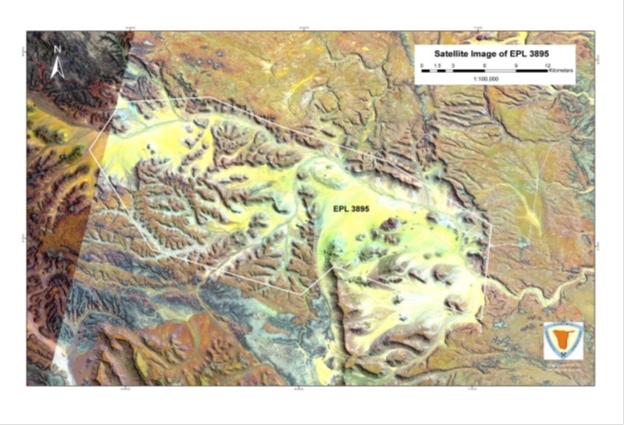 The Aukam Graphite Mine deposit is located in an unusual area of southern Namibia with both summer and winter rainfall. In the austral summer, day-time temperature peak in the mid 40° Celsius, while in winter temperatures can go as low as freezing. Rainfall in winter is generally light drizzle with occasional harder falls and sometimes flurries. In summer, the rainfall is associated with occasional thunderstorms and is of short duration, but can be of very high intensity. All of the streams within the area are ephemeral and can flow very strongly after summer rainfall. Average annual rainfall is 50-150 mm. The Aukam Graphite Mine is the only mine in Namibia which has produced graphite. The ore body lies on the eastern slope of a prominent range of hills which rises 120 to 150 meters above the level of the surrounding sand covered valleys. The country rock consists almost entirely of grayish, medium- to coarse grained granite and gneissic rocks of the Namaqualand Metamorphic Complex. The graphite-bearing zone, which strikes east-west, is about 10 m wide and is traceable over a distance of some 350 m. The graphite, which is of the fine-flaky to lumpy type, usually contains malachite specks, while sulphur occurs along cracks. The graphite veins are flanked by a pale green, highly epidotized and kaolinized granite which is soft and highly decomposed. Parallel stringers of ferruginous and micaceous talcose material are associated with the veins. The best quality graphite is located in the central lode and was initially worked by opencast mining along the slope, as the softness of the rocks in this area greatly facilitated mining operations. The excavation, which now measures 45 by 35 m, was later supplemented by two adits sited further downhill along the same lode, and a third was developed above the opencast pit. The lowermost tunnel is about 120 m long. Large-scale sloping from these adits yielded several thousand tons of graphite. The deposit was mined from 1940 to 1956 when the workings were destroyed by fire. Production was resumed in 1964 and ceased in 1974. Graphite occurs as veins and lenses in the East-West striking vertical zone, 10m wide and 350m long. At the bottom of the hill it disappears underneath the sand cover, whereas near the summit it peters out. The zone comprises three parallel lodes. Veins, lenses and pockets of ore, several meters wide, dip 70o to 90o to the south. Graphite is considered to be the purest form of carbon. Graphite is an excellent conductor of heat and electricity and has a high melting temperature of 3,500 degrees Celsius. It is extremely resistant to acid, chemically inert and highly refractory. The utility of graphite is dependent largely upon its type. Crystalline flake graphite, or flake graphite, occurs as isolated, flat, plate-like particles with hexagonal edges, if unbroken, and when broken, the edges can be irregular or angular. Amorphous graphite occurs as fine particles and is the result of thermal metamorphism of coal, the last stage of coalification, and is sometimes called meta-anthracite. Very fine flake graphite is sometimes called amorphous in the trade. 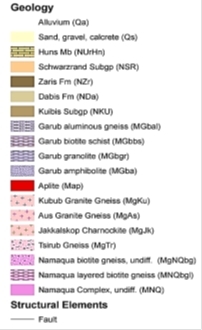 Lump graphite, or vein graphite, occurs in fissure veins or fractures and appears as massive platy intergrowths of fibrous or acicular crystalline aggregates, and is probably hydrothermal in origin. All grades of graphite, especially high grade amorphous and crystalline graphite that remains suspended in oil are used as lubricants. Graphite has an extraordinarily low co-efficient of friction under most working conditions. This property is invaluable in lubricants. It diminishes friction and tends to keep the moving surface cool. Dry graphite as well as graphite mixed with grease and oil is utilized as a lubricant for heavy and light bearings. Graphite grease is used as a heavy-duty lubricant where high temperatures may tend to remove the grease. The flake type graphite is found to possess extremely low resistivity to electrical conductance. The electrical resistivity decreases with the increase of flaky particles. The bulk density decreases progressively as the particles become flakier. Because of this property in flake graphite, it is used in the manufacture of carbon electrodes, plates and brushes required in the electrical industry and dry cell batteries. Flake graphite has been replaced to some extent by synthetic, amorphous, crystalline graphite and acetylene black in the manufacture of plates and brushes. Flake graphite containing 80 to 85% carbon is used for crucible manufacture; graphite containing a carbon content of 93% and above is preferred for the manufacture of lubricants, and graphite containing a carbon content of 40 to 70% is utilized for foundry facings. Natural graphite, refined or otherwise pure, having carbon content not less than 95% is used in the manufacture of carbon rods for dry battery cells. The recent surge in interest and value of graphite is built on long standing and solid fundamentals as a well-established industrial mineral. Natural graphite has been mostly consumed in steel making; for refractories and foundry facings; as a lubricant and as a containment lining in nuclear applications. Other uses have included automobile brake linings and transmission components, but with the extraordinary increase in the use of lithium-Ion batteries, graphite has experienced a huge growth surge and the auto industry is sure to be at the forefront of this growth. Prices of large-flake, high carbon graphite has increased from $600 per metric ton during the 1990s to highs of approximately $2,500 per metric ton recently. Industry participants believe that positive trends in graphite prices could continue in the coming years as China is expected to continue to tighten regulations regarding exports of graphite. A report by Industrial Minerals, a leading source of information on critical minerals, stated that the Chinese government is focused on consolidating the domestic graphite industry and is going ahead with plans to reduce the number of graphite mines in Hunan province from 230 to around 20, with increased government supervision aimed at reducing environmental impact due to harmful mining practices. This is expected to lead to a loss of around 100,000 metric tons of graphite per year, or approximately 10 percent of the global supply. Recent prices for flake graphite have seen $1,500 - $3,000 per tons depending on flake size and grade. Graphite prices have seen increases for large flake, high purity graphite (+80 mesh, 94-97%C) and have more than doubled in recent years. China, which produces about 80 percent of the world's graphite, is reducing its 200 amorphous graphite mines to 20 and creating a state-run monopoly causing disruptions in supply. Industrial Minerals recently reported exports from China in January and February 2012 have been reduced by 55.3% and 60.1% from 2011 level exports from Hunan Province. It is not expected that current graphite mines in other countries could replace Chinese amorphous supply. Currently, the largest graphite mines produce only 20,000 tons per year. Predictions are that the current world-wide graphite consumption of 1.2 million tons per year will increase by 200,000 tons per year by 2015. This would require approximately ten mines of 20,000 tons per year to come on stream to meet demand. If changes to graphite mining in China are fully implemented, there could be added pressure on demand and a corresponding price increase as indicated by the increasing prices in the last two years. The Company has prepared a plan to re-launch mining production and on-site processing at an estimated cost of $2,000,000. The completed, re-opened mine will be targeting an estimated 2,000 tons of annual production. Initial activities in 2013-2014 have included the testing of the Aukum Graphite Mine samples, the compilation of our initial geological report, and the completed purchase of 100% of the mine. Additional 2014 activities will include: process testing of surface graphite samples; preparation of an Environmental Impact Assessment report; application for a Mining License for extraction; a preliminary economic analysis based on our findings and a scoping study that details the engineering for production, mining design, flowchart and operations; construction planning for a small-scale processing facility; and securing basic processing equipment in-country. In early 2015, the Company plans to begin processing its existing 140,000 tons of graphite tailings for bulk sampling, and to start test production. The company is targeting to gear up to graphite production of 2,000 tons per year in the second half of 2015. The Global Graphite market, currently estimated at $12 billion, is expected to grow at a CAGR of 5.5% during 2012-2016. One key factor is the increasing use of graphite in batteries, e.g., the Li-Ion market is estimated at ~$250B by 2020. The Company plans to be operating in the Republic of Namibia, a country that is mining-friendly, has infrastructure in place, and has low labor costs. Although there can be no assurance, large and well capitalized markets are readily available for all metals and precious metals throughout the world. A very sophisticated futures market for the pricing and delivery of future production also exists. The price for metals is affected by a number of global factors, including economic strength and resultant demand for metals for production, fluctuating supplies, mining activities and production by others in the industry, and new and or reduced uses for subject metals. The mining industry is highly speculative and of a very high risk nature. As such, mining activities involve a high degree of risk, which even a combination of experience, knowledge and careful evaluation may not be able to overcome. Few mining projects actually become operating mines. The mining industry is subject to a number of factors, including intense industry competition, high susceptibility to economic conditions (such as the price of metal, foreign currency exchange rates, and capital and operating costs), and political conditions (which could affect such things as import and export regulations, foreign ownership restrictions). Furthermore, the mining activities are subject to all hazards incidental to mineral exploration, development and production, as well as risk of damage from earthquakes, any of which could result in work stoppages, damage to or loss of property and equipment and possible environmental damage. Hazards such as unusual or unexpected geological formations and other conditions are also involved in mineral exploration and development. The Company does not have any Intellectual Property at this time. The mineral exploration industry is highly competitive. We are a new exploration stage company and have a weak competitive position in the industry. We compete with junior and senior mineral exploration companies, independent producers and institutional and individual investors who are actively seeking to acquire mineral exploration properties throughout the world together with the equipment, labor and materials required to operate on those properties. Competition for the acquisition of mineral exploration interests is intense with many mineral exploration leases or claims available in a competitive bidding process in which we may lack the technological information or expertise available to other bidders. We will be required to comply with all regulations, rules and directives of governmental authorities and agencies applicable to the exploration of minerals in the Republic of Namibia, including those which govern prospecting, mineral exploration, drilling, mining, production, mineral extraction, transportation of minerals, taxes, labor standards, occupational health, waste disposal, protection of the environment, mine safety, hazardous substances and several other matters. An Environmental Impact Assessment is currently being prepared, and a Mining License for extraction will be applied for. Additional approvals and authorizations may be required from other government agencies, depending upon the nature and scope of the proposed exploration program. The amount of these costs is not known as we do not know the size, quality of any resource or reserve at this time. It is impossible to assess the impact of any capital expenditures on earnings or our competitive position. Our exploration activities are also subject to laws and regulations of Namibia governing protection of the environment. These laws are continually changing and, as a general matter, are becoming more restrictive. Our policy is to conduct business in a way that safeguards public health and the environment and in material compliance with applicable environmental laws and regulations. Changes to current laws and regulations in the jurisdictions where we operate could require additional capital expenditures and increased operating costs. Although we are unable to predict what additional legislation and the associated costs of such legislation, if any, might be proposed or enacted, additional regulatory requirements could render certain exploration activities uneconomic. As of March 31, 2014, the Company and its subsidiaries had no employees. The Company utilizes the services of consultants and advisors. These include its principal executive officer, chief financial officer, geological personnel, accountants, and attorneys. Some of these positions, especially those of a technical nature, may be converted to employment if and when the Company's business requires and resources permit. The Company is an “emerging growth company”, as defined in the Jumpstart Our Business Startups Act of 2012 (“JOBS Act”), and may take advantage of certain exemptions from various reporting requirements that are applicable to other public companies that are not “emerging growth companies” including, but not limited to, not being required to comply with the auditor attestation requirements of section 404(b) of the Sarbanes-Oxley Act, and exemptions from the requirements of Sections 14A(a) and (b) of the Securities Exchange Act of 1934 to hold a nonbinding advisory vote of shareholders on executive compensation and any golden parachute payments not previously approved. The Company has elected to use the extended transition period for complying with new or revised accounting standards under Section 102(b)(1) of the JOBS Act. This election allows us to delay the adoption of new or revised accounting standards that have different effective dates for public and private companies until those standards apply to private companies. As a result of this election, our financial statements may not be comparable to companies that comply with public company effective dates. We will remain an “emerging growth company” until the earliest of (1) the last day of the fiscal year during which our revenues exceed $1 billion, (2) the date on which we issue more than $1 billion in non-convertible debt in a three year period, (3) the last day of the fiscal year following the fifth anniversary of the date of the first sale of our common equity securities pursuant to an effective registration statement filed pursuant to the Securities Act of 1933, as amended, or (4) when the market value of our common stock that is held by non-affiliates exceeds $700 million as of the last business day of our most recently completed second fiscal quarter. To the extent that we continue to qualify as a “smaller reporting company”, as such term is defined in Rule 12b-2 under the Securities Exchange Act of 1934, after we cease to qualify as an emerging growth company, certain of the exemptions available to us as an emerging growth company may continue to be available to us as a smaller reporting company, including: (1) not being required to comply with the auditor attestation requirements of Section 404(b) of the Sarbanes Oxley Act; (2) scaled executive compensation disclosures; and (3) the requirement to provide only two years of audited financial statements, instead of three years. The Company has a limited history of operations and is in the early stage of development. The Company is engaged in the business of exploring, resuming production and developing a single asset, the Aukum Graphite Project, in the hope of ultimately, at some future point, placing the Aukum Graphite Project back into production. The Aukum Graphite Project will be for the foreseeable future the Company’s sole asset. Although management believes the Aukum Graphite Project has sufficient merit to justify focusing all the Company’s limited resources upon it, the Company will in consequence be exposed to some heightened degree of risk due to the lack of property diversification. The Aukum Graphite Project is assumed to still host graphitic material that has been historically mined. However, there are no guarantees that the re-launched production of these potentially indicated and inferred resources will ever be demonstrated, in whole or in part, to be profitable to mine. 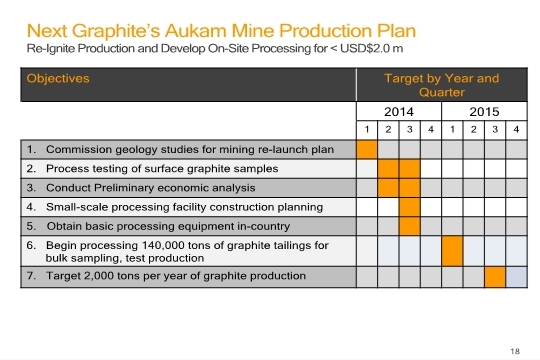 Development of the Aukum Graphite Project will only follow upon obtaining satisfactory results from the recommended multi-phase testing, exploration and development program and any subsequent work and studies that may be required. There can be no assurance that any of the Company’s planned exploration and development activities on the Aukum Graphite Project will ever lead to the re-launch of graphite production from it. The exploration and development of mineral projects is highly speculative in nature and involves a high degree of financial and other risks over a significant period of time, which even a combination of careful evaluation, experience and knowledge may not reduce or eliminate. The Aukum Graphite Project will constitute the Company’s sole asset. However, there are no guarantees that there will ever be a profitable mining operation on the Aukum Graphite Project. The proposed multi-phase exploration and development program on the Aukum Graphite Project is subject to a significant degree of risk. Whether a mineral deposit will be commercially viable depends on a number of factors, including the particular attributes of the deposit (i.e. size, grade, access, flake size distribution, contaminants, and proximity to infrastructure), financing costs, the cyclical nature of commodity prices and government regulations (including those relating to prices, taxes, currency controls, royalties (both product and monetary), land tenure, land use, importing and exporting of mineral products, and environmental protection). The effect of these factors or a combination thereof cannot be accurately predicted but could have an adverse impact on the Company. Even though the Aukam Graphite Project has produced graphite historically, the Company has never had an interest in a mineral-producing property. There is no assurance that commercial quantities of minerals will be discovered at any future properties, nor is there any assurance that any future exploration programs of the Company on the Aukum Graphite Project or any future properties will yield any positive results. Even where commercial properties of minerals are discovered, there can be no assurance that any property of the Company will ever be brought to a stage where mineral reserves can be profitably produced thereon. Factors that may limit the ability of the Company to produce mineral resources from its property include, but are not limited to, the price of mineral resources are explored, availability of additional capital and financing and the nature of any mineral deposits. Mining operations generally involve a high degree of risk. The Company’s operations will be subject to all of the hazards and risks normally encountered in mineral exploration and development. Such risks include unusual and unexpected geological formations, seismic activity, rock bursts, cave-ins, water inflows, fires and other conditions involved in the drilling and removal of material, environmental hazards, industrial accidents, periodic interruptions due to adverse weather conditions, labor disputes, political unrest and theft. The occurrence of any of the foregoing could result in damage to, or destruction of, mineral properties or interests, production facilities, personal injury, damage to life or property, environmental damage, delays or interruption of operations, increases in costs, monetary losses, legal liability and adverse government action. The Company does not currently carry insurance against these risks and there is no assurance that such insurance will be available in the future, or if available, at economically feasible premiums or acceptable terms. The potential costs associated with losses or liabilities not covered by insurance coverage may have a material adverse effect upon the Company’s financial condition. The Company has a limited operating history, has no operating revenues and is unlikely to generate any revenues from operations in the immediate future. Its existing cash resources are not sufficient to cover its projected funding requirements for the ensuing year. If its phased exploration and development program is successful, additional funds will be required to bring the Aukum Graphite Project back into production. The Company has limited financial resources and there is no assurance that sufficient additional funding will be available to enable it to fulfill its obligations or for further exploration and development on acceptable terms or at all. Failure to obtain additional funding on a timely basis could result in delay or indefinite postponement of further exploration and development and could cause the Company to reduce or terminate its operations. If we cease to continue as a going concern, due to lack of funding or otherwise, you may lose your entire investment in the Company. Our current plans indicate that we will need substantial additional capital to implement our plan of operations before we have any anticipated revenues. When we require additional funds, general market conditions or the then-current market price of our common stock may not support capital raising transactions such as additional public or private offerings of our common stock. If we require additional funds and we are unable to obtain them on a timely basis or on terms favorable to us, we may be required to scale back our development of new products, sell or license some or all of our technology or assets, or curtail or cease operations. The future operations of the Company, including exploration and development activities and the commencement and continuation of commercial production, require licenses, permits or other approvals from various federal, provincial and local governmental authorities and such operations are or will be governed by laws and regulations relating to prospecting, development, mining, production, exports, taxes, labor standards, occupational health and safety, waste disposal, toxic substances, land use, water use, environmental protection, land claims of indigenous people and other matters. The Company believes that the Aukum Graphite Project is in substantial compliance with all material laws and regulations that currently apply to its activities. There can be no assurance, however, that the Company will obtain on reasonable terms or at all the permits and approvals, and the renewals thereof, which it may require for the conduct of its future operations or that compliance with applicable laws, regulations, permits and approvals will not have an adverse effect on plans to explore and develop the Aukum Graphite Project. Possible future environmental and mineral tax legislation, regulations and actions could cause additional expense, capital expenditures, restrictions and delay on the Company’s planned exploration and operations, the extent of which cannot be predicted. Failure to comply with applicable laws, regulations and permitting requirements may result in enforcement actions thereunder, including orders issued by regulatory or judicial authorities causing operations to cease or be curtailed, and may include corrective measures requiring capital expenditures, installation of additional equipment, or remedial actions. Parties engaged in mining operations may be required to compensate those suffering loss or damage by reason of the mining activities and may have civil or criminal fines or penalties imposed for violations of applicable laws or regulations. 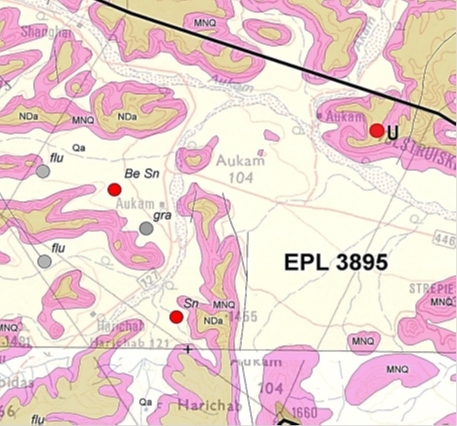 In preparing the initial property report, The Aukum property Geological Report of February 16, 2014, the authors of that report from Element 12 Consulting relied upon certain data generated on production from the government-mining ministry, and by exploration work carried out by geologists employed by others. There is no guarantee that data generated from government records or by prior exploration work is 100% reliable and discrepancies in such data not discovered by the Company may exist. Such errors and/or discrepancies, if they exist, could impact on the accuracy of the subject report. The success of the Company will be largely dependent upon the performance of its senior management and directors. Due to the relative small size of the Company, the loss of these persons or the inability of the Company to attract and retain additional highly skilled employees may adversely affect its business and future operations. The Company has not purchased any “key-man” insurance nor has it entered into any non-competition or non-disclosure agreements with any of its directors, officers or key employees and has no current plans to do so. The Company has hired and may continue to rely upon consultants and others for geological and technical expertise. The Company’s current personnel may not include persons with sufficient technical expertise to carry out the future development of the Company’s properties. There is no assurance that suitably qualified personnel can be retained or will be hired for such development. The mineral exploration and mining business is competitive in all of its phases. The Company competes with numerous other companies and individuals, including competitors with greater financial, technical and other resources, in the search for and the acquisition of attractive mineral properties. The mining industry is facing a shortage of equipment and skilled personnel and there is intense competition for experienced geologists, field personnel, contractors and management. There is no assurance that the Company will be able to compete successfully with others in acquiring such equipment or personnel. The mineral exploration and mining business is competitive in all phases of exploration, development and production. The Company competes with a number of other entities in the search for and acquisition of productive mineral properties. As a result of this competition, the majority of which is with companies with greater financial resources than the Company, the Company may be unable to acquire attractive properties in the future on terms it considers acceptable. The Company also competes for financing with other resources companies, many of whom have greater financial resources and/or more advanced properties. There can be no assurance that additional capital or other types of financing will be available if needed or that, if available, the terms of such financing will be favorable to the Company. The land lot comprising the Aukum Graphite Project is owned by an unrelated third party, and the Company will need to obtain a leasehold interest to such land lot before it can commence mining operations. Under the laws of Namibia, the grant of a mining license guarantees access to the land where a mineral deposit is located. The financial terms of such access, however, need to be negotiated directly with the land owner. While the Company believes that it will be able to negotiate financially sound terms of such access when mining is commenced, there can be no assurance or guarantee that such terms will be acceptable to the Company. 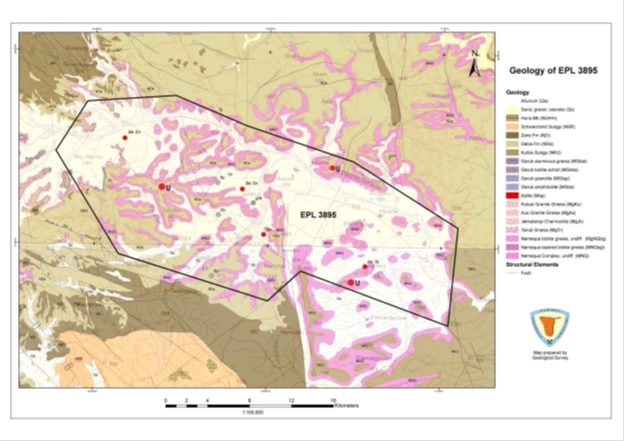 The Company possesses the license to the Aukum Graphite Project allowing for prospecting operations, bulk sampling and pilot production (subject to ministry approval) in the license area, which expires on April 3, 2015. While the Namibian government has an interest in the license area being developed and the Company believes that it will be able to obtain necessary extensions on the prospecting license and grant of a mining license required to recommence mining operations, there can be no assurance that the Company will be able to secure the renewal of the prospecting license or grant of a mining license on terms satisfactory to it, or that governments having jurisdiction over the Aukum Graphite Project will not revoke or significantly alter such license or other tenures or that such license and tenures will not be challenged or impugned. All phases of the Company’s operations will be subject to environmental regulation in the jurisdictions in which it operates. These regulations mandate, among other things, the maintenance of air and water quality standards and land reclamation and provide for restrictions and prohibitions on spills, releases or emissions of various substances produced in association with certain mining industry activities and operations. They also set forth limitations on the generation, transportation, storage and disposal of hazardous waste. A breach of such regulation may result in the imposition of fines and penalties. In addition, certain types of mining operations require the submission and approval of environmental impact assessments. Environmental legislation is evolving in a manner which will require stricter standards and enforcement, increased fines and penalties for non-compliance, more stringent environmental assessments of proposed projects and a heightened degree of responsibility for companies and their officers, directors and employees. The cost of compliance with changes in governmental regulations has the potential to reduce the viability or profitability of operations of the Company. The Aukum Graphite Project has in the past been subject to an environmental study. Additional environmental studies will, however, be required as the Company’s anticipated exploration and development programs unfold. It is always possible that, as work proceeds, environmental hazards may be identified on the Aukum Graphite Project which are at present unknown to the Company and which may have the potential to negatively impact on the Company’s exploration and development plans for the Aukum Graphite Project. The price of the Company’s securities, its financial results and its exploration, development and mining activities may be significantly adversely affected by declines in the price of graphite. Industrial mineral prices fluctuate widely and are affected by numerous factors beyond the Company’s control such as the sale or purchase of industrial minerals by various dealers, interest rates, exchange rates, inflation or deflation, currency exchange fluctuation, global and regional supply and demand, production and consumption patterns, speculative activities, increased production due to improved mining and production methods, government regulations relating to prices, taxes, royalties, land tenure, land use, importing and exporting of minerals, environmental protection, the degree to which a dominant producer uses its market strength to bring supply into equilibrium with demand, and international political and economic trends, conditions and events. The prices of industrial minerals have fluctuated widely in recent years, and future price declines could cause continued exploration and development of the Aukum Graphite Project to be impracticable. Further, reserve calculations and life-of-mine plans using significantly lower industrial mineral prices could result in material write-downs of the Company’s investment in the Aukum Graphite Project and increased amortization, reclamation and closure charges. In addition to adversely affecting reserve estimates and the Company’s financial condition, declining commodity prices can impact operations by requiring a reassessment of the feasibility of a particular project. Such a reassessment may be the result of a management decision or may be required under financing arrangements related to a particular project. Even if the project is ultimately determined to be economically viable, the need to conduct such a reassessment may cause substantial delays or may interrupt operations until the reassessment can be completed. Although no assurance can be given, the Company contemplates that growth will occur as the Company implements its business strategies. The Company expects the expansion of its business to place a significant strain on its limited managerial, operational, and financial resources. The Company will be required to expand its operational and financial systems significantly and to expand, train, and manage its work force in order to manage the expansion of its operations. The Company’s failure to fully integrate new employees into its operations could have a material adverse effect on its business, prospects, financial condition, and results of operations. The Company’s ability to attract and retain highly skilled personnel in connection with its growth is critical to its operations and expansion. The Company faces competition for these types of personnel from other biotechnology companies and more established organizations, many of which have significantly larger operations and greater financial, marketing, human, and other resources than does the Company. The Company may not be successful in attracting and retaining qualified personnel on a timely basis, on competitive terms, or at all. If the Company is not successful in attracting and retaining these personnel, its business, prospects, financial condition, and results of operations will be materially adversely affected. There has been no active public market for the Company common stock. An active public market for the Company's common stock may not develop or be sustained. 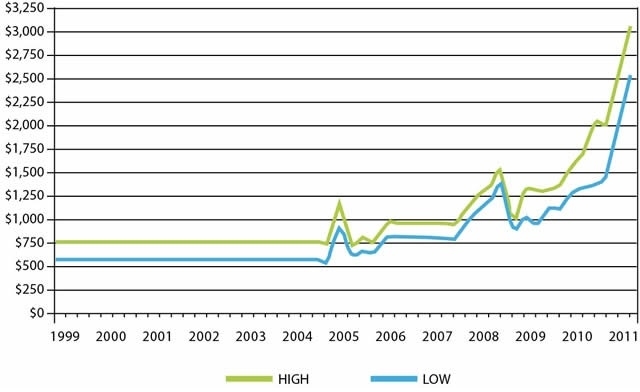 The market price of the common stock may fluctuate significantly in response to factors, some of which are beyond the Company's control, such as product liability claims or other litigation, the announcement of new pharmaceuticals or pharmaceutical enhancements by the Company’s competitors, developments concerning intellectual property rights and regulatory approvals, quarterly variations in competitors' results of operations, changes in earnings estimates or recommendations by securities analysts, developments in our industry, and general market conditions and other factors, including factors unrelated to our operating performance. We may in the future issue our previously authorized and unissued securities, resulting in the dilution of the ownership interests of our common stockholders. We are currently authorized to issue one hundred million shares of common stock and ten million shares of preferred stock with such designations, preferences and rights as determined by our board of directors. Issuance of additional shares of common stock may substantially dilute the ownership interests of our existing stockholders. We may also issue additional shares of our common stock or other securities that are convertible into or exercisable for common stock in connection with the hiring of personnel, future acquisitions, future public or private placements of our securities for capital raising purposes, or for other business purposes. Any such issuance would further dilute the interests of our existing stockholders. From time to time, the Company may be involved in lawsuits. The outcomes of any such legal actions may have a material adverse effect on the financial results of the Company on an individual or aggregate basis. The Company has no earnings or dividend record and does not anticipate paying any dividends on its common shares in the foreseeable future. The SEC has adopted regulations which generally define "penny stock" to be an equity security that has a market or exercise price of less than $5.00 per share, subject to specific exemptions. The market price of the Company’s common stock may be below $5.00 per share and therefore may be designated as a "penny stock" according to SEC rules. This designation requires any broker or dealer selling these securities to disclose certain information concerning the transaction, obtain a written agreement from the purchaser and determine that the purchaser is reasonably suitable to purchase the securities. These rules may restrict the ability of brokers or dealers to sell such shares and may affect the ability of investors to sell their shares. In addition, since the Company’s common stock is currently quoted on the OTC Bulletin Board, investors may find it difficult to obtain accurate quotations of the stock and may find few buyers to purchase the stock or a lack of market makers to support the stock price. Failure to achieve and maintain effective internal controls in accordance with Section 404 of the Sarbanes-Oxley Act of 2002 could prevent the Company from producing reliable financial reports or identifying fraud. In addition, current and potential stockholders could lose confidence in the Company's financial reporting, which could have an adverse effect on the Company's stock price. Effective internal controls are necessary for the Company to provide reliable financial reports and effectively prevent fraud, and a lack of effective controls could preclude the Company from accomplishing these critical functions. We are required to document and test our internal control procedures in order to satisfy the requirements of Section 404 of the Sarbanes-Oxley Act of 2002 (the “Sarbanes-Oxley Act”), which requires annual management assessments of the effectiveness of the Company's internal controls over financial reporting. If we fail to maintain the adequacy of our internal accounting controls, as such standards are modified, supplemented or amended from time to time, we may not be able to ensure that we can conclude on an ongoing basis that we have effective internal controls over financial reporting in accordance with Section 404. Failure to achieve and maintain an effective internal control environment could cause investors to lose confidence in our reported financial information, which could have an adverse effect on our stock price. Under the JOBS Act we have elected to use an extended period for complying with new or revised accounting standards. We have elected to use the extended transition period for complying with new or revised accounting standards under Section 102(b)(1), which allows us to delay adoption of new or revised accounting standards that have different effective dates for public and private until those standards apply to private companies. As a result of this election, our financial statements may not be comparable to companies that comply with public company effective dates. The Company’s direct 90% owned subsidiary Gazania owns a 100% undivided interest in the exclusive prospecting license No. 3895 known as AUKUM originally issued to Centre by the government of the Republic of Namibia on April 4, 2011 and renewed on April 4, 2013 (the “License”). The License grants the right to conduct prospecting operations, bulk sampling and pilot production in the license area called AUKAM located in southern Namibia in the Karas Region within the Betaine district. The license area covers about 49,127 hectares. The property is named after the Aukam Farm where it is located. A surface royalty will have to be discussed with the farm owner when mining recommences on the property. Under the laws of Namibia, the grant of a mining license guarantees access to the land where a mineral deposit is located. The financial terms of such access, however, need to be negotiated directly with the land owner. The Company believes that it will be able to negotiate financially sound terms of such access when mining is recommenced. From time to time, we may become involved in various lawsuits and legal proceedings which arise in the ordinary course of business. However, litigation is subject to inherent uncertainties, and an adverse result in these or other matters may arise from time to time that may harm our business. We are currently not aware of any such legal proceedings or claims that we believe will have a material adverse effect on our business, financial condition or operating results. Our Common Stock, $.0001 par value, is quoted on the OTC Bulletin Board under the symbol “GPNE.” There were no reported quotations for our common stock during the fiscal years 2013 and 2012. Since our inception, we have not declared nor paid any cash dividends on our capital stock and we do not anticipate paying any cash dividends in the foreseeable future. Our current policy is to retain any earnings in order to finance our operations. Our Board of Directors will determine future declarations and payments of dividends, if any, in light of the then-current conditions it deems relevant and in accordance with applicable corporate law. We have no existing equity compensation plan. CERTAIN STATEMENTS IN THIS REPORT, INCLUDING STATEMENTS IN THE FOLLOWING DISCUSSION, ARE WHAT ARE KNOWN AS "FORWARD-LOOKING STATEMENTS", WHICH ARE BASICALLY STATEMENTS ABOUT THE FUTURE. FOR THAT REASON, THESE STATEMENTS INVOLVE RISK AND UNCERTAINTY SINCE NO ONE CAN ACCURATELY PREDICT THE FUTURE. WORDS SUCH AS "PLANS", "INTENDS", "WILL", "HOPES", "SEEKS", "ANTICIPATES", "EXPECTS "AND THE LIKE OFTEN IDENTIFY SUCH FORWARD-LOOKING STATEMENTS, BUT ARE NOT THE ONLY INDICATION THAT A STATEMENT IS A FORWARD-LOOKING STATEMENT. SUCH FORWARD-LOOKING STATEMENTS INCLUDE STATEMENTS CONCERNING OUR PLANS AND OBJECTIVES WITH RESPECT TO THE PRESENT AND FUTURE OPERATIONS OF THE COMPANY, AND STATEMENTS WHICH EXPRESS OR IMPLY THAT SUCH PRESENT AND FUTURE OPERATIONS WILL OR MAY PRODUCE REVENUES, INCOME OR PROFITS. NUMEROUS FACTORS AND FUTURE EVENTS COULD CAUSE THE COMPANY TO CHANGE SUCH PLANS AND OBJECTIVES OR FAIL TO SUCCESSFULLY IMPLEMENT SUCH PLANS OR ACHIEVE SUCH OBJECTIVES, OR CAUSE SUCH PRESENT AND FUTURE OPERATIONS TO FAIL TO PRODUCE REVENUES, INCOME OR PROFITS. THEREFORE, THE READER IS ADVISED THAT THE FOLLOWING DISCUSSION SHOULD BE CONSIDERED IN LIGHT OF THE DISCUSSION OF RISKS AND OTHER FACTORS CONTAINED IN THIS REPORT ON FORM 10-K AND IN THE COMPANY'S OTHER FILINGS WITH THE SECURITIES AND EXCHANGE COMMISSION. NO STATEMENTS CONTAINED IN THE FOLLOWING DISCUSSION SHOULD BE CONSTRUED AS A GUARANTEE OR ASSURANCE OF FUTURE PERFORMANCE OR FUTURE RESULTS. The Company plans to re-launch mining production and on site processing at the Aukum Graphite Mine at an estimated cost of $2,000,000. The completed mine is targeting 2,000 tons of annual production. We did not have any revenues since inception. We incurred operating expenses of $2,569,223, and realized a net loss of $2,569,223 since inception on August 29, 2013 to December 31, 2013. As of December 31, 2013, we had $2,450 in cash. The Company does not currently have sufficient resources to cover ongoing expenses and expansion. From November 2013 to March 2014, we consummated a private placement of our securities which resulted in net proceeds to us of $1,098,900. We used $240,000 out of the net proceeds to make a payment to NMC under the Option Agreement in connection with the option grant closing and the option exercise closing. Under the Option Agreement, we undertook to provide at least $260,000 of working capital to or for the benefit of Gazania from the option grant closing date to June 30, 2014. plan on raising additional funds from investors to implement our business model. In the event we are unsuccessful, this will have a negative impact on our operations. The Company's financial statements are prepared on a going concern basis, which contemplates the realization of assets and the satisfaction of obligations in the normal course of business. However, it has $2,450 in cash, has losses and an accumulated deficit, and a working capital deficiency. The Company does not currently have any revenue generating operations. These conditions, among others, raise substantial doubt about the ability of the Company to continue as a going concern. In view of these matters, continuation as a going concern is dependent upon continued operations of the Company, which in turn is dependent upon the Company's ability to, meets its financial requirements, raise additional capital, and the success of its future operations. The financial statements do not include any adjustments to the amount and classification of assets and liabilities that may be necessary should the Company not continue as a going concern. We do not have off-balance sheet arrangements, financings, or other relationships with unconsolidated entities or other persons, also known as "special purpose entities" (SPEs). The Company's consolidated audited financial statements for the fiscal years ended December 31, 2013 and 2012, together with the report of the independent certified public accounting firm thereon and the notes thereto, are presented beginning at page F-1. We changed our independent registered public accounting firm effective December 5, 2013 from LBB & Associates Ltd., LLP (“LBB”) to Anton & Chia LLP. Information regarding the change in the independent registered public accounting firm was disclosed in our Current Report on Form 8-K filed with the SEC on December 11, 2013. There were no disagreements with LBB or any reportable events requiring disclosure under Item 304(b) of Regulation S-K. The Securities and Exchange Commission defines the term “disclosure controls and procedures” to mean controls and other procedures of an issuer that are designed to ensure that information required to be disclosed in the reports that it files or submits under the Securities Exchange Act of 1934 is recorded, processed, summarized and reported, within the time periods specified in the Securities and Exchange Commission’s rules and forms. Disclosure controls and procedures include, without limitation, controls and procedures designed to ensure that information required to be disclosed by an issuer in the reports that it files or submits under the Securities Exchange Act of 1934 is accumulated and communicated to the issuer’s management, including its principal executive and principal financial officers, or persons performing similar functions, as appropriate to allow timely decisions regarding required disclosure. The Company maintains such a system of controls and procedures in an effort to ensure that all information which it is required to disclose in the reports it files under the Securities Exchange Act of 1934 is recorded, processed, summarized and reported within the time periods specified under the SEC's rules and forms and that information required to be disclosed is accumulated and communicated to principal executive and principal financial officers to allow timely decisions regarding disclosure. As of the end of the period covered by this report, we carried out an evaluation, under the supervision and with the participation of our chief executive officer and chief financial officer, of the effectiveness of the design and operation of our disclosure controls and procedures. Based on this evaluation, our chief executive officer and chief financial officer concluded that our disclosure controls and procedures were not effective as of the end of the period covered by this report. Our management is responsible for establishing and maintaining adequate internal control over financial reporting as defined in Rules 13a-15(f) and 15d-15(f) under the Securities Exchange Act. Our internal control over financial reporting is designed to provide reasonable assurance regarding the (i) effectiveness and efficiency of operations, (ii) reliability of financial reporting and the preparation of financial statements for external purposes in accordance with generally accepted accounting principles, and (iii) compliance with applicable laws and regulations. Management assessed the effectiveness of our internal control over financial reporting as of the end of the period covered by this report. In making this assessment, we used the criteria set forth by the Committee of Sponsoring Organizations of the Treadway Commission (COSO) in Internal Control - Integrated Framework. Based on our assessment, we determined that, as of the end of the period covered by this report, our internal control over financial reporting was not effective based on those criteria. Lack of Internal Audit Function – We lack qualified resources to perform the internal audit functions properly as well as oversight of recording and reporting of information. In addition, the scope and effectiveness of the internal audit function are yet to be developed. Review of Financial Information and Financial Reporting – We do not have adequate levels of review of financial information necessary to ascertain the accounting for complex transactions as well as review of financial information presented. Lack of Segregation of Duties – We do not have segregation of duties between recording, authorizing and testing. As soon as we can raise sufficient capital or our operations generate sufficient cash flow, we will hire additional personnel to handle our accounting and reporting functions. While the first two steps of our remediation process are ongoing, we do not expect to remediate the weaknesses in our internal controls over financial reporting until the time when we start to commercialize our products (and, therefore, may have sufficient cash flow for hiring sufficient personnel to handle our accounting and reporting functions). This annual report does not include an attestation report of our registered public accounting firm regarding internal control over financial reporting. Management’s report was not subject to attestation by our registered public accounting firm because as a smaller reporting company we are not subject to Section 404(b) of the Sarbanes-Oxley Act of 2002. No change in our system of internal control over financial reporting occurred during the fourth quarter of the fiscal year ended December 31, 2013 that has materially affected, or is reasonably likely to materially affect, our internal control over financial reporting. As previously reported in the Current Report on Form 8-K filed by the Company with the SEC on March 20, 2014, on March 14, 2014, the Company exercised its option under the Option Agreement with NMC and completed its acquisition of 90% of the outstanding shares of Gazania which currently holds the License to the Aukum Graphite Mine. As a result of the option exercise and acquisition of Gazania, the Company ceased to be a shell company as such term is defined in Rule 12b-2 under the Exchange Act. Michael Doron, age 52, is an accomplished corporate leader with executive level experience in the financing of small to mid-cap private and public companies. Currently based in Stockholm, Sweden, he is also Managing Partner at DDR & Associates, a business development firm specializing in pre-IPO companies. Previously Mr. Doron was Co-Founder and a Partner in Evolution Capital, a private firm working in conjunction with DDR, and specializing in providing capital to publicly held companies using various debt instruments. He serves on the Board of Directors of MusclePharm Corp (NASDAQ: MSLP), and Great East Energy, Inc. (OTCQB: GASE). We believe that Mr. Doron’s qualifications and his extensive experience with emerging public companies provide a unique perspective for our board. Charles Bream, age 69, is a seasoned executive, turnaround expert, and investor with over 30 years experience leading companies in the telecommunications, computer, office products, and packaged goods sectors. He has managed public and private companies as president/CEO, has served as a senior executive at Fortune 500 corporations, and has worked in environments ranging in revenue from $1 million to over $15 billion. Mr. Bream was appointed President and CEO of Next Graphite, Inc. in October 2013. He is also Managing Partner of an M&A and merchant banking firm which he co-founded. Prior to this he served as Senior Managing Director at a national specialty financial advisory services firm, and as Senior Managing Director at a turnaround and restructuring firm. Mr. Bream holds a B.S. in Electrical Engineering from the United States Naval Academy and earned an MBA from the Wharton School of Business, University of Pennsylvania. We believe that Mr. Bream’s qualifications and his extensive business experience position him well as our director. Our directors hold their positions on the board until our next annual meeting of the shareholders, and until their successors have been qualified after being elected or appointed. Officers serve at the discretion of the board of directors. There are no family relationships among our directors and executive officers. There is no arrangement or understanding between or among our executive officers and directors pursuant to which any director or officer was or is to be selected as a director or officer, and there is no arrangement, plan or understanding as to whether non-management shareholders will exercise their voting rights to continue to elect the current board of directors. We currently do not have standing audit, nominating or compensation committees. Currently, our entire board of directors is responsible for the functions that would otherwise be handled by these committees. We intend, however, to establish an audit committee, a nominating committee and a compensation committee of the board of directors as soon as practicable. We envision that the audit committee will be primarily responsible for reviewing the services performed by our independent auditors, evaluating our accounting policies and our system of internal controls. The nominating committee would be primarily responsible for nominating directors and setting policies and procedures for the nomination of directors. The nominating committee would also be responsible for overseeing the creation and implementation of our corporate governance policies and procedures. The compensation committee will be primarily responsible for reviewing and approving our salary and benefit policies (including stock options), including compensation of executive officers. The Board of Directors does not currently have Audit Committee financial expert, as defined under Item 407(d)(5)(i) of Regulation S-K.
We do not have a code of ethics but intend to adopt one in the near future. Charles Bream is our Chief Executive Officer. Michael Doron is the Chairman of our Board of Directors. We believe a board leadership structure involving one person serving as chairman and another as chief executive officer is best for our company and our stockholders. Further, we believe this separation improves the Board’s oversight of management, provides greater accountability of management to stockholders, and allows the chief executive officer to focus on managing our business operations, while allowing the chairman to focus on more effectively leading the Board and overseeing our general strategic direction and extraordinary transactions. Since we do not have an audit or compensation committee comprised of independent Directors, the functions that would have been performed by such committees are performed by our Board of Directors. Thus, there is a potential conflict of interest in that our Directors have the authority to determine issues concerning management compensation, in essence their own, and audit issues that may affect management decisions. We are not aware of any other conflicts of interest with any of our executives or Directors. The Board assesses on an ongoing basis the risks faced by the Company. These risks include financial, technological, competitive, and operational risks. The Board dedicates time at each of its meetings to review and consider the relevant risks faced by the Company at that time. In addition, since the Company does not have an Audit Committee, the Board is also responsible for the assessment and oversight of the Company’s financial risk exposures. The following is a summary of the compensation we paid to our executive officers, for the two fiscal years ended December 31, 2013 and 2012. Mr. Bream was appointed as the Chief Executive Officer, Chief Financial Officer and Director of the Company on November 14, 2013. Mr. Doron was appointed as our Chairman and Director of the Company on November 14, 2013. Mr. Mulla resigned as our Chief Executive Officer, Chief Financial Officer and Sole Director of the Company on November 14, 2013. We intend to provide our named executive officers (as defined in Item 402 of Regulation S-K) with a competitive base salary that is in line with their roles and responsibilities when compared to peer companies of comparable size in similar locations. On September 2, 2013, AGI and 360 Partners, LLC (the “Consultant”) entered into an independent consultant agreement for the service of Mr. Charles Bream, the principal of the Consultant as AGI’s Chief Executive Officer, Chief Financial Officer, Director and Treasurer for a term of six months. On November 14, 2013 he was appointed to the same positions at the Company. The agreement is automatically renewable for additional six months unless either party notifies the other at least 30 days prior to the end of the term of an intention to terminate. Under the agreement, the Consultant is compensated with a monthly cash compensation of US$3,000, payable in arrears. The Consultant also received 38,462 shares of AGI’s common stock that were exchanged for approximately 300,004 shares of the Company’s common stock on November 14, 2103, which are not subject to any vesting conditions or subject to forfeiture. On September 27, 2013 AGI and Michael Doron entered into an independent consultant agreement as AGI’s Chairman and Director for a term of six months. On November 14, 2013 he was appointed to the same positions at the Company. The agreement is automatically renewable for additional six months unless either party notifies the other at least 30 days prior to the end of the term of an intention to terminate. Under the agreement, Mr. Doron is compensated with a monthly cash compensation of US$1,000, payable in arrears. Mr. Doron also received 12,821 shares of AGI’s common stock that were exchanged for approximately 100,012 shares of the Company’s common stock on November 14, 2103, which are not subject to any vesting conditions or subject to forfeiture. We have no plans that provide for the payment of retirement benefits, or benefits that will be paid primarily following retirement, including, but not limited to, tax qualified defined benefit plans, supplemental executive retirement plans, tax qualified defined contribution plans and non-qualified defined contribution plans. The amounts in these columns represent the compensation cost of stock awards granted during the fiscal year ended December 31, 2013, except that these amounts do not include any estimate of forfeitures. The amount recognized for these awards was calculated based on the value of the stock awards at the time of vesting. The following table sets forth information regarding beneficial ownership of our common stock as of the date of this report by (i) any person or group with more than 5% of any class of voting securities, (ii) each director, (iii) our chief executive officer and each other executive officer whose cash compensation for the most recent fiscal year exceeded $100,000, and (iv) all such executive officers and directors as a group. Unless otherwise specified, the address of each of the officers and directors set forth below is in care of the Company, 318 N. Carson Street, Suite 208, Carson City, NV 89701. Except as indicated in the footnotes to this table and subject to applicable community property laws, the persons named in the table to our knowledge have sole voting and investment power with respect to all shares of securities shown as beneficially owned by them. Beneficial ownership is determined in accordance with the rules of the SEC and generally includes voting or investment power with respect to securities. Based on 49,431,443 shares of the Company’s common stock outstanding. Includes shares held by 360 Partners, LLC, an entity controlled by Charles Bream. Ms. Vicki Rosenthal and Mr. David Deslauriers have shared voting and dispositive power over the shares held by NMC Corp.
As of the date of this report, there were no arrangements which may result in a change in control of the Company. On September 26, 2012, we issued an aggregate of 3,000,000 pre-split shares of our common stock to our sole officer and director, Mr. Mohsin Mulla, for a purchase price of $0.005 per share for aggregate consideration of $15,000. On November 1, 2013, we issued 300,000 pre-split shares of our common stock to Mr. Mulla for aggregate consideration of $300. On November 14, 2013, Mr. Mulla and AGI entered into and consummated transactions pursuant to a Stock Purchase Agreement whereby Mr. Mulla sold to AGI for $76,000 all 3,300,000 of his pre-split shares of the Company’s common stock representing approximately 50.8% of the then issued and outstanding shares of common stock. On November 14, 2013, the Company issued 12,600,003 shares of its common stock to NMC in connection with the option grant under the Option Agreement. On March 26, 2014 the Company cancelled the 3,300,000 pre-split shares of the Company’s stock acquired under the Stock Purchase Agreement with Mr. Mulla, resulting in the current 49,431,443 shares of the Company’s common stock outstanding. Other than the above transactions or as otherwise set forth in this report or in any reports filed by the Company with the SEC, there have been no related party transactions, or any other transactions or relationships required to be disclosed pursuant to Item 404 of Regulation S-K. The Company is currently not a subsidiary of any company. The Company’s Board conducts an appropriate review of and oversees all related party transactions on a continuing basis and reviews potential conflict of interest situations where appropriate. The Board has not adopted formal standards to apply when it reviews, approves or ratifies any related party transaction. However, the Board believes that the related party transactions are fair and reasonable to the Company and on terms comparable to those reasonably expected to be agreed to with independent third parties for the same goods and/or services at the time they are authorized by the Board. We are not subject to listing requirements of any national securities exchange and, as a result, we are not at this time required to have our board comprised of a majority of “independent Directors.” We do not believe that any of our directors currently meets the definition of “independent” as promulgated by the rules and regulations of NASDAQ. These services were provided by Anton & Chia, LLP who were engaged December 5, 2013. These services were provided by LBB & Associates Ltd., LLP who were engaged through December 5, 2013. Audit Fees. Represents fees for professional services provided for the audit of the Company’s annual financial statements and review of its quarterly financial statements, and for audit services provided in connection with other statutory or regulatory filings. Audit-Related Fees. Represents fees for assurance and other services related to the audit of Company’s financial statements. Tax Fees. Represents fees for professional services provided primarily for tax compliance and advice. All Other Fees. Represents fees for products and services not otherwise included in the categories above. In the event that we should require substantial non-audit services, the audit committee would pre-approve such services and fees. Incorporated by reference to our Current Report on Form 8-K filed with the SEC on November 20, 2013. Incorporated by reference to our Registration Statement on Form S-1 filed with the SEC on December 5, 2012. Incorporated by reference to our Current Report on Form 8-K filed with the SEC on December 18, 2013. Incorporated by reference to our Current Report on Form 8-K filed with the SEC on December 11, 2013. Pursuant to the requirements of Section 13 or 15(d) of the Securities Exchange Act of 1934, this Report has been signed below by the following persons on behalf of the Registrant in the capacities and on the dates indicated. Stockholders of Next Graphite, Inc.
We have audited the accompanying balance sheet of Next Graphite, Inc. as of December 31, 2013, and the related statement of operations, changes in stockholders’ equity, and cash flows for the period from August 29, 2013 (inception) to December 31, 2013. Next Graphite, Inc.’s management is responsible for these financial statements. Our responsibility is to express an opinion on these financial statements based on our audits. 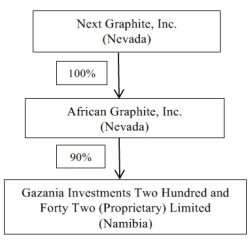 In our opinion, the financial statements referred to above present fairly, in all material respects, the financial position of Next Graphite, Inc. as of December 31, 2013, and from August 29, 2013 (inception) through December 31, 2013, and the results of its operations and its cash flows for the period then ended in conformity with accounting principles generally accepted in the United States of America. The accompanying financial statements referred to above have been prepared assuming that the Company will continue as a going concern. As discussed in Note 7 to the financial statements, the Company’s present financial situation raises substantial doubt about its ability to continue as a going concern. Management’s plans in regard to this matter are also described in Note 7. The financial statements do not include any adjustments that might result from the outcome of this uncertainty. (1) All common share amounts and per share amounts in these financial statements reflect the seven point eight-for-one stock split of the issued and outstanding shares of common stock of the Company, effective December 16, 2013, including retroactive adjustment of common share amounts. See Note 4. (2) All common share amounts and per share amounts in these financial statements reflect the seven point eight-for-one stock split of the issued and outstanding shares of common stock of the Company, effective December 16, 2013, including retroactive adjustment of common share amounts. See Note 4. (3) Retroactively adjusted to reflect the 7.8 - 1 stock split effective December 16, 2013. See Note 4. Next Graphite, Inc. (the “Company”) was incorporated in Nevada on August 29, 2013 under the name Zewar Jewellery, Inc. and is a development-stage entity. The Company's current business plan is to engage in the mining business developing graphite properties located in Namibia. The Company is based in Carson City, Nevada. On November 14, 2013, the Company consummated transactions pursuant to a Share Exchange Agreement (the “Share Exchange Agreement”) dated November 14, 2013 by and among the Company and the stockholders of African Graphite, Inc., a private Nevada corporation (“AGI” and the “AGI Stockholders”) whereby AGI Stockholders transferred 100% of the outstanding shares of common stock of AGI held by them, in exchange for an aggregate of 8,980,047 newly issued shares of the Company’s common stock, par value $.0001 per share (“Common Stock”). On November 14, 2013, AGI entered into a Stock Purchase Option Agreement (the “Option Agreement”) with NMC Corp., a corporation organized under the laws of the Province of Ontario, Canada (“NMC”), whereby NMC granted to AGI an option to purchase 90 ordinary shares, par value one Namibian dollar per share, of Gazania Investments Two Hundred and Forty Two (Proprietary) Limited, a corporation organized under the laws of the Republic of Namibia ("Gazania"), representing 90% of the issued and outstanding shares of Gazania, for $240,000. NMC had entered into an option agreement dated March 29, 2013, as amended on November 4, 2013 (the “Centre Agreement”), with Centre for Geoscience Research CC (formerly known as “Industrial Minerals and Rock Research Centre CC”), a company organized under the laws of the Republic of Namibia ("Centre"), whereby Centre agreed to transfer to Gazania 100% undivided interest in the exclusive prospecting license No. 3895 known as AUKUM originally issued to Centre by the government of the Republic of Namibia on April 4, 2011 and renewed on April 4, 2013 (the “License”). The License grants the right to conduct prospecting operations, bulk sampling and pilot production in the license area called AUKAM located in southern Namibia in the Karas Region within the Betaine district. The license area covers about 49,127 hectares. The only mine in Namibia which has produced graphite is situated in the license area. The transfer of the License to Gazania was approved by the Ministry of Mines and Energy of the Republic of Namibia on February 25, 2014. The Company is considered to be in the development stage as defined in ASC 915-10-05, “Development Stage Entity.” The Company is devoting substantially all of its efforts to the execution of its business plan. The Merger was accounted for as a reverse-merger and recapitalization in accordance with generally accepted accounting principles in the United States (“GAAP”). African Graphite, Inc. is the acquirer for financial reporting purposes and Next Graphite, Inc. is the acquired company. African Graphite, Inc. was incorporated on August 29, 2013 (“Inception”). Consequently, the assets and liabilities and the operations that are reflected in the historical financial statements prior to the Merger are those of African Graphite, Inc. from Inception and are recorded at the historical cost basis of African Graphite, Inc, and the consolidated financial statements after completion of the Merger include the assets and liabilities of African Graphite, Inc. and Next Graphite, Inc; and historical operations of Next Graphite, Inc and African Graphite, Inc. since the closing date of the Merger. Common stock and the corresponding capital account of the Company pre-merger have been retroactively restated as capital stock shares reflecting the exchange ratio in the Merger. Cash and cash equivalents consists principally of currency on hand, demand deposits at commercial banks, and liquid investment funds having a maturity of three months or less at the time of purchase. The Company did not have cash equivalents as of December 31, 2013. In accordance with ASC 720-15-20, “Start-up Activities,” the Company expenses all costs incurred in connection with the start-up and organization of the Company. We periodically issue stock options and warrants to employees and non-employees in non-capital raising transactions for services and for financing costs. We account for stock option and warrant grants issued and vesting to employees based on Financial Accounting Standards Board (FASB) ASC Topic 718, “Compensation – Stock Compensation”, whereas the award is measured at its fair value at the date of grant and is amortized ratably over the vesting period. We account for stock option and warrant grants issued and vesting to non-employees in accordance with ASC Topic 505, “Equity”, whereas the value of the stock compensation is based upon the measurement date as determined at either (a) the date at which a performance commitment is reached, or (b) at the date at which the necessary performance to earn the equity instruments is complete. The Company has evaluated recent accounting pronouncements and their adoption has not had nor is it expected to have a material impact on the Company’s financial position, or statements. The Company recognizes the tax effects of transactions in the year in which such transactions enter into the determination of net income regardless of when reported for tax purposes. Deferred taxes are provided in the financial statements under FASC 740-10-65-1 to give effect to the temporary differences which may arise from differences in the bases of fixed assets, depreciation methods and allowances based on the income taxes expected to be payable in future years. Minimal development stage deferred tax assets arising as a result of net operating loss carry-forwards have been offset completely by a valuation allowance due to the uncertainty of their utilization in future periods. Operating loss carry-forwards generated during the period from August 29, 2013 (date of inception) through December 31, 2013 of approximately $37,799 will begin to expire in 2033. Accordingly, deferred tax assets related to the net operating loss of approximately $37,799 were fully reserved as of December 31, 2013. The Company recognizes interest accrued relative to unrecognized tax benefits in interest expense and penalties in operating expense. During the period from August 29, 2013 (inception) to December 31, 2013 the Company recognized no income tax related interest and penalties. The Company had no accruals for income tax related interest and penalties at December 31, 2013. As of December 31, 2013 the Company had (i) 100,000,000 shares of Ccommon Stock authorized with a par value of $.0001 per share, of which 74,900,043 shares were issued and outstanding, and (ii) 25,000,000 shares of preferred stock, par value $.0001 per share, authorized, none of which was issued and outstanding. 8,980,047 shares of Common Stock have been issued to founders, of which 400,016 shares were issued to the President and director as part of their consulting agreements, further discussed in note 6. The shares were valued at par for a value of $898. On November 14, 2013, the Company entered into and consummated transactions pursuant to a Subscription Agreement (the “Subscription Agreement”) with certain accredited investors whereby the Company issued and sold to the investors for $1.00 per share an aggregate of 249,998 shares of the Company’s Common Stock for an aggregate purchase price of $250,000. As share-based compensation to employees and non-employees, the Company issued 2,369,991 shares of common stock valued at $2,369,991, based on the market price of the stock on the date of issuance. On November 14, 2013, the Company consummated transactions pursuant to the Share Exchange Agreement with AGI dated November 14, 2013 by and among the Company and the stockholders of AGI whereby the AGI Stockholders transferred 100% of the outstanding shares of common stock of AGI held by them, in exchange for an aggregate of 8,980,047 newly issued shares of Common Stock. On November 14, 2013, the Company issued 12,600,003 shares of Common Stock to NMC in connection with the option grant closing under the Option Agreement. All shares presented in these financial statements and accompanying footnotes have been retroactively adjusted to reflect the increased number of shares resulting from the seven point eight-to-one forward stock split effective on December 16, 2013. In connection with the sale of Common Stock discussed in note 10, the Company has received $40,400 in advances for subscriptions prior to December 31, 2013. The related party payables consist of compensation to the Company’s Chairman and CEO for their services. Each of them is to receive monthly cash payment in addition to the Company’s common shares for the period of August 29, 2013 through December 31, 2013. Under the consulting agreements, the Chairman and CEO are to receive monthly compensation in the amount of $3,000 and $1,000 plus expense reimbursements respectively. The total of compensation to these related party payments for the period ended December 31, 2013 totaled $8,000. The accompanying financial statements have been prepared in accordance with accounting principles generally accepted in the United States of America, which contemplates continuation of the Company as a going concern. The Company has incurred approximately $2,569,223 in operating deficit since its inception, and has generated no operating revenue, which could raise substantial doubt about the Company’s ability to continue as a going concern. In view of these matters, realization of the assets of the Company is dependent upon the Company’s ability to meet its financial requirements through equity financing and the success of future operations. These financial statements do not include adjustments relating to the recoverability and classification of recorded asset amounts and classification of liabilities that might be necessary should the Company be unable to continue in existence. As of December 31, 2013, the Company had $90,000 paid in cash for deposit in investment in subsidiary. On February 3, 2014, the Company sold 271,400 shares of Common Stock, for gross proceeds of $271,400 at a per share price of $1.00 pursuant to a Subscription Agreement with an accredited investor. On March 14, 2014, AGI exercised its option under the Option Agreement and the Company paid to NMC the balance of the purchase price in the amount of $150,000 outstanding under the Option Agreement. On March 14, 2014, the Company sold 550,000 shares of Common Stock, for gross proceeds of $550,000 at a per share price of $1.00 pursuant to a Subscription Agreement with an accredited investor. On March 20, 2014, the Company entered into a consulting agreement with Wall Street Relations, Inc. (the “Consultant”). Under the agreement, the Consultant will provide to the Company public relations, communications, advisory and consulting services. The term of the agreement is 12 months. For the services to be rendered under the agreement, the Company paid to the Consultant $500,000 in cash. On March 25, 2014, the Company sold 150,000 shares of Common Stock, for gross proceeds of $150,000 at a per share price of $1.00 pursuant to a Subscription Agreement with an accredited investor.